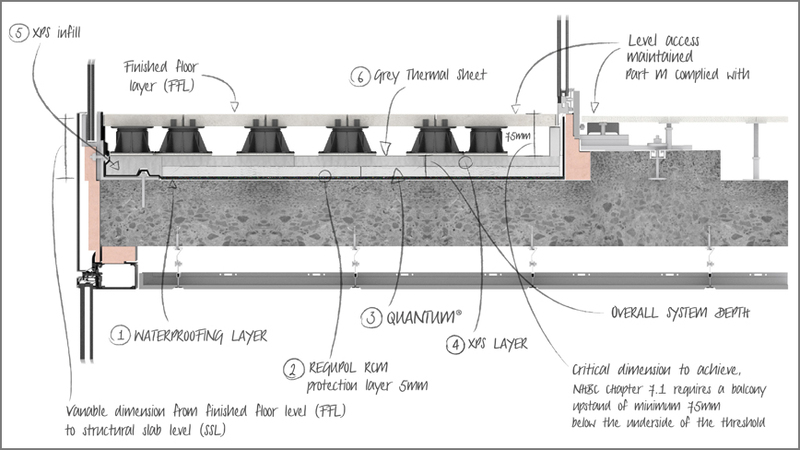 Radmat ProTherm Quantum Inverted Roof Insulation System has been developed to allow the thinnest possible construction. Consisting of Quantum VIP panels (Vacuum Insulation Panels), Regupol RCM, XPS Infill, XPS layer and Grey Thermal Sheet, a Protherm Quantum VIP Inverted Roof System achieves a ‘U’ value of 0.15 W/mk2 using 80% less thickness than a traditional XPS insulation. Manufactured in a state of the art production facility in the UK Quantum VIP panels consist of a microporous core which is evacuated of air and moisture prior to being encased and sealed in thin, gas-tight special hybrid aluminium. This combination provides outstanding aged design value thermal conductivity of 0.008 W/m.K, thereby achieving the thinnest possible insulation solution available today. • The waterproofing system must be BBA Certified for inverted roof applications. • The waterproofing system must be installed correctly, watertight and clean. • The surface of the waterproofing should be clean, dry, level and free from projections. • Where required the roof waterproofing should be inspected for guarantee purposes prior to the installation of the ProTherm Quantum Hybrid Inverted Roof Insulation system. • ProTherm Quantum Hybrid Inverted Roof Insulation systems should not be used in association with solvent-based adhesive systems, or be exposed to naked flames or excessive heat. • The product is delivered to site bearing the manufacturer’s name and the BBA logo incorporating the number of this Certificate. • The packaging of the ProTherm Quantum VIP panels should not be considered adequate for outdoor protection. 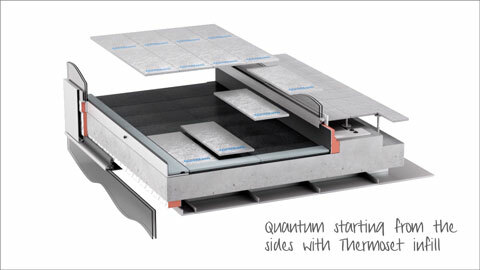 • The ProTherm Quantum VIP panels should be stored inside a building and raised off the floor. • ProTherm Quantum VIP panels should not be walked directly on prior to completion of the installation. • A protective foot or crawl board should be used during the installation process. • Regupol RCM, XPS infill, XPS Layer and Grey Thermal Sheet may be walked on during construction. • ProTherm Quantum VIP panels should not be cut or penetrated. • Care must be taken to prevent contact with solvents and materials containing organic components. • Where large volumes are stored, especially indoors, flammable material and ignition sources should not be permitted in the vicinity and adequate ventilation (at least two air changes per hour) should be ensured. See attached Product Data Sheet for further information. • Where required the roof waterproofing should be inspected for guarantee purposes prior to the installation of the ProTherm Quantum Pure Inverted Roof Insulation system. • ProTherm Quantum Pure Inverted Roof Insulation systems should not be used in association with solvent-based adhesive systems, or be exposed to naked flames or excessive heat.